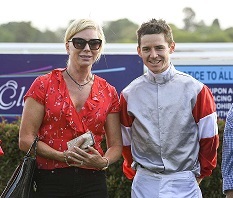 A year ago jockey Jason Collett denied Kim Waugh a Provincial Championships win but on Saturday he’ll be able to square the ledger if he can guide Safado home at Royal Randwick. Safado is one of three starters for the Wyong trainer in the $500,000 Polytrack Provincial Championships Final (1400m) along with Spring Charlie and Fuchu, who gained a start with the scratching of It’s So Obvious on Friday. Collett took out the 2018 edition for Kris Lees on Serene Miss and Waugh had to settle for second with Newsfan but an improving track has the jockey hopeful he can go back-to-back. “It’s an even bunch, obviously the favourite (Archedemus) hasn’t done anything wrong whereas we come into the race off a heavy track run so the form doesn’t read as well,’’ he said. The four-year-old, $7 with TAB, downed Spring Charlie to win the Hawkesbury Qualifier back on February 24 but basically sunk in the wet ground at Rosehill four weeks ago. Waugh sent Safado back to the trials last week to rebuild him and he responded with an easy win. With Randwick rated a soft 5 on Friday and the potential for an upgrade the chance is there for the gelding to rebound. “I’ll be looking forward to walking the track after the first race to get a better idea of how it is,’’ Collett said. “He struggled a couple of starts back at Canterbury on just a soft track, it took away his turn of foot. And the other day he basically couldn’t pick his feet up. The track pattern, not so much condition, Collett says will be vital to the chances of Group 1 placed mare Spright in the Group 2 $300,000 TAB Sapphire Stakes (1200m). There’s little doubt Spright boasts some strong form lines through her eye-catching and slightly unlucky last start Group 1 second to Sunlight, since placed in last week’s TJ Smith Stakes, at Moonee Valley on Golden Slipper eve. She’ll likely start favourite, $4 with TAB, to send punters home on a winning note and Collett knows she’s a mare he has to time his run perfectly on. “She’s going to produce runs like that due to her style of racing, being a backmarker, but if she produces it again you’d expect her to be hard to beat,’’ he said. “I’ll see how the track is playing by that stage of the day. Collett considers himself an upset chance of finally grabbing a Group 1 victory on Saturday on both Red Cardinal ($21) in the $2m Schweppes Sydney Cup (3200m) and Rocknavar ($51) in the $1m Heinekin 3 Australian Oaks (2400m). “Red Cardinal would have preferred a softer track. He was disappointing last start but he didn’t have a lot of luck in a slowly run race sitting wide,’’ he said.